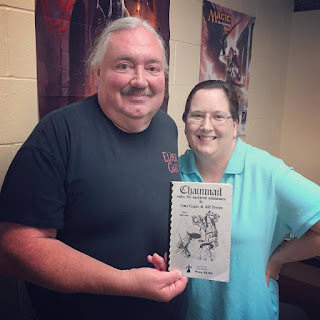 Weekly regular Norm brought his copy of DungeonQuest (1985) to our last meeting so we could take it for a spin. 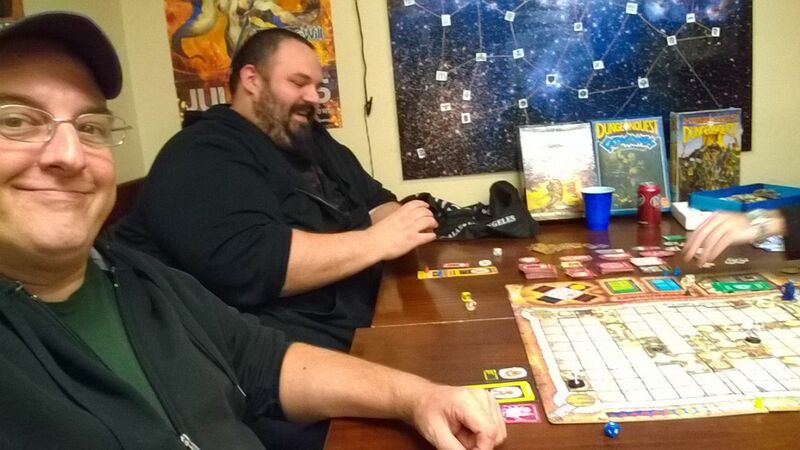 It's a fairly straightforward game with few actions to take with base characters and perhaps too many for the expansion characters. They probably shouldn't be mixed in the same game. Nevertheless, I had the Dwarf Berserker so I was fairly tough and happy I was able to take some heavy hits. 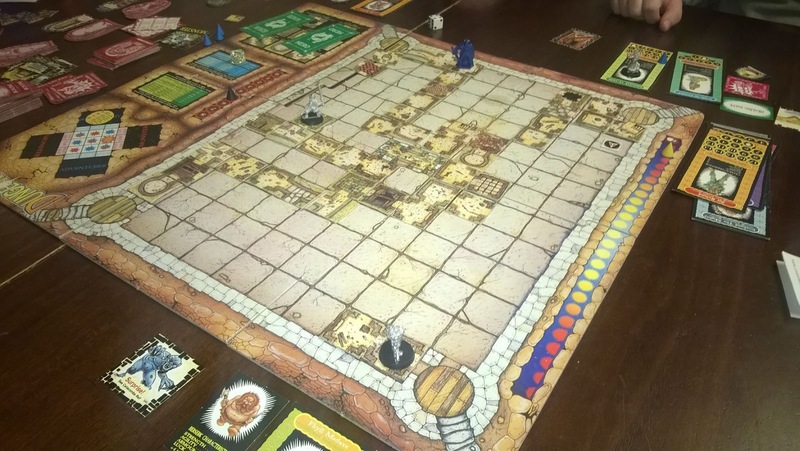 Players explore the ruins of Castle Dragonfire trying to reach the treasure chamber in the center of the dungeon and escape alive with as much treasure as possible. 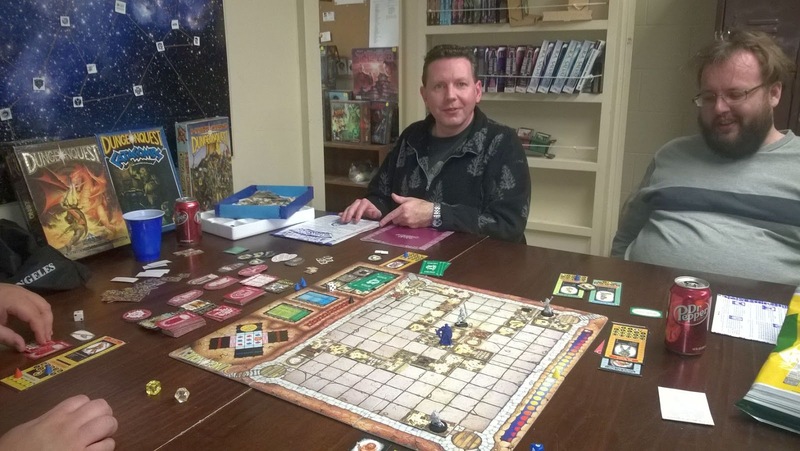 A limited number of turns before the game ends puts pressure on players to take risks and score rewards because anyone left in the dungeon when time runs out dies! 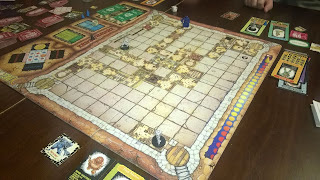 A tile-laying system creates the maze-like dungeon and ensures that no two games are ever exactly the same. I decided to employ an unusual strategy with this game, even though it meant I would be playing rather little during the actual game. It seemed to me that since the game is purportedly so deadly and very few character ever make it out alive (often the game results in everyone losing), that hanging out toward my entrance and just collecting scrap treasures from minor room searches might be enough to win the game. While this is risky, since even one or two treasures from the dragon at the center easily outstrips scraps, I wanted to see if others would find themselves trapped by a portcullis or one-way doors, or revolving rooms, and unable to exit before time ran out. In this instance, it actually worked but I can see now that the odds of it working repeatedly aren't huge.